Calmodulin Antagonists and Cellular Physiology focuses on the biochemistry of calmodulin antagonists as regulators of cellular physiology. Emphasis is placed on the use of calmodulin antagonists as an indicator of calmodulin function. The mechanism of action of calmodulin antagonists and their interactions with calmodulin are explored. 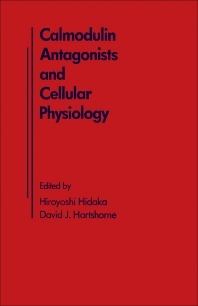 This book is comprised of 33 chapters and begins with an introduction to the biochemical aspects of calmodulin as well as its distribution and functions, followed by a discussion on how calmodulin antagonists and other agents modulate Ca2+-dependent regulatory systems. The next section is devoted to the mechanism of action of calmodulin antagonists and includes chapters that examine the interaction of various drugs with calmodulin and the structure-activity relationships of calmodulin antagonists. The effects of calmodulin antagonists on cell proliferation and growth are then discussed. The remaining chapters deal with the role of calmodulin antagonists in cell function and the contractile process, along with their effect on protein kinase C. This monograph will be a useful resource for biochemists as well as students and researchers in biochemistry.